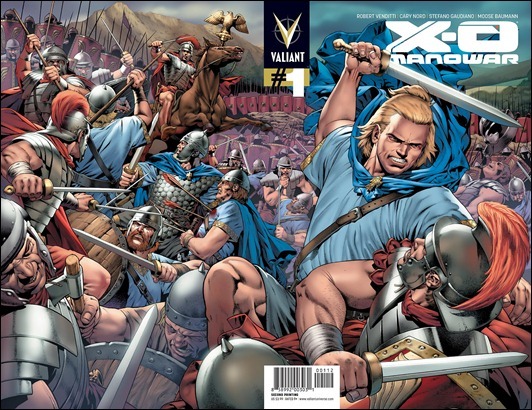 "We’ve been telling the industry for months that Valiant would have everyone talking in 2012, but these figures have exceeded even our expectations," said Publisher Fred Pierce. "We can’t thank the retail community enough for the massive support they’ve shown us, and this sellout speaks volumes about the amazing job our creators are doing with this series." "This is an outstanding performance for an independent publisher, especially with a debut title. We look forward to great things from Valiant in the months and years to come," said Bill Schanes, VP of Purchasing for Diamond Comic Distributors, Inc.
"The success of this book is due in no small part to Rob and Cary’s phenomenal work, and our staff deserves a big round of applause as well," said Valiant Chief Creative Officer Dinesh Shamdasani. "Warren, Fred, and the rest of the team spent months making sure Valiant’s return would make as big an impact as possible." "Valiant has never underestimated the resonance that its characters have with comics fans around the world," added Valiant CEO Jason Kothari. "X-O Manowar #1 has already taken a lot of people by surprise, and, with Harbinger #1 and Bloodshot #1 just around the corner, this is truly going to be a summer of Valiant."